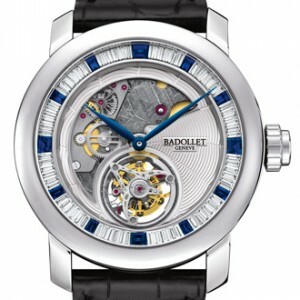 The Stellaire by Badollet has its head in the stars. Imbued with a dreamlike sense of mystery, it is distinguished by a plate entirely crafted in meteorite and by the upper bridge of the tourbillon carriage set with extra-terrestrial olivines, representing an unprecedented technical feat. The movement bridges appear to be floating weightlessly, forming galactic circles reminiscent of the path traced by stars spinning around the same centre of gravity. Nature itself plays a part in making each of these watches truly unique, since the high proportion of iron in the meteorite, exposed to cosmic rays for around 93 million years, may modify the colour of the movement without altering its functionality. 30-piece limited series. 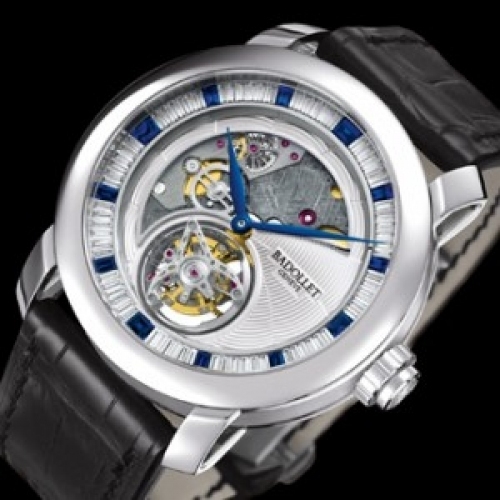 Hand-wound, BAD1630 calibre with flying tourbillon, 13¼ lignes, 21,600 vib/h, 120-hour power reserve; meteorite plate and upper bridge of the tourbillon carriage set with olivines.